Atlona will attend ISE 2017 (February 7-10, Amsterdam RAI) with an array of new solutions in AV and IP signal distribution for commercial and residential AV systems, including an entry into the control category. Atlona will present live demonstrations at stand 5-S92 to showcase several of its technological advances. This includes the international debut of OmniStream, Atlona’s first line of AV-over-IP products. In addition to the booth, there will be a dedicated room for showcasing AV solutions to pre-registered integrators, consultants, and resellers. ISE also marks the debut of several new Atlona switching, distribution, and connectivity solutions. The recently announced AT-UHD-CLSO-840 is an 8x4, 4K HDMI, and HDBaseT switcher for videoconferencing, distance learning, and training rooms. 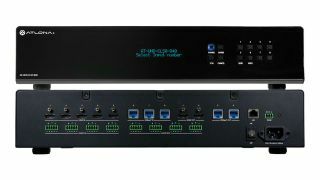 Atlona will also introduce a new member of the SW-5 4K/UHD switcher series featuring DisplayPort and USB-C connectivity with support for wireless BYOD. Atlona will also show updates to its EDID emulation tools, audio converters, plus HDMI distribution and switching products. Most notable among its product launches at ISE is the introduction of the Atlona Control Suite and Atlona Control Gateway. Combined, these will provide customers with a scalable platform for control of Atlona and third-party products. The cloud-based system management approach of the Atlona Control Suite enables control system configuration using a web browser along with offsite device monitoring and control. The Atlona Control Gateway performs device control commands.